Use the form below to inquire about Heritage Boutique Stay In Thanjavur . Use the form below to reserve for Heritage Boutique Stay In Thanjavur . 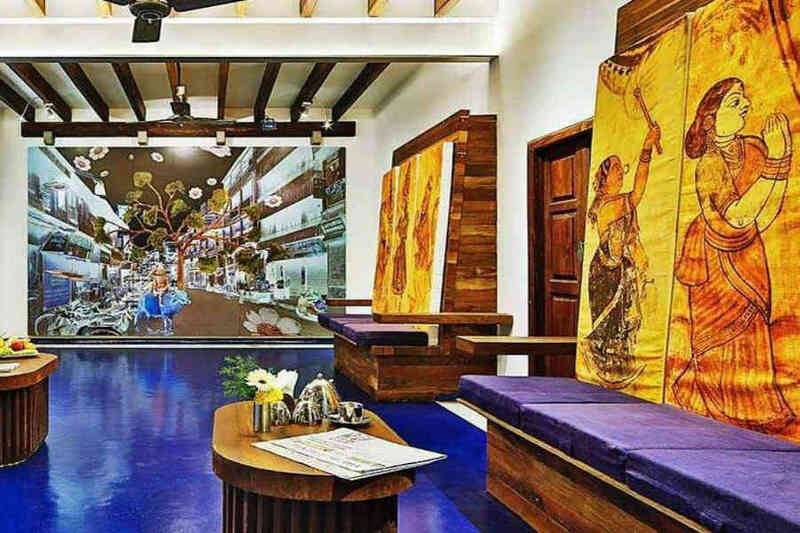 Immerse yourself in the culture and art of decades past and feel at home at this Heritage Boutique Stay in Thanjavur. 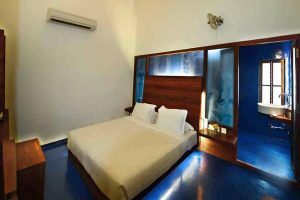 Located in the heart of the city, in close proximity to the ancient Thanjavur Palace, this boutique hotel is an amalgamation of tradition with modernity. The UNESCO World Heritage Temple and palace museum are also easily accessible from this Heritage Boutique Stay in Thanjavur. This Heritage Boutique Stay in Thanjavur dates back to the 1920s and was once a wealthy merchant’s mansion. 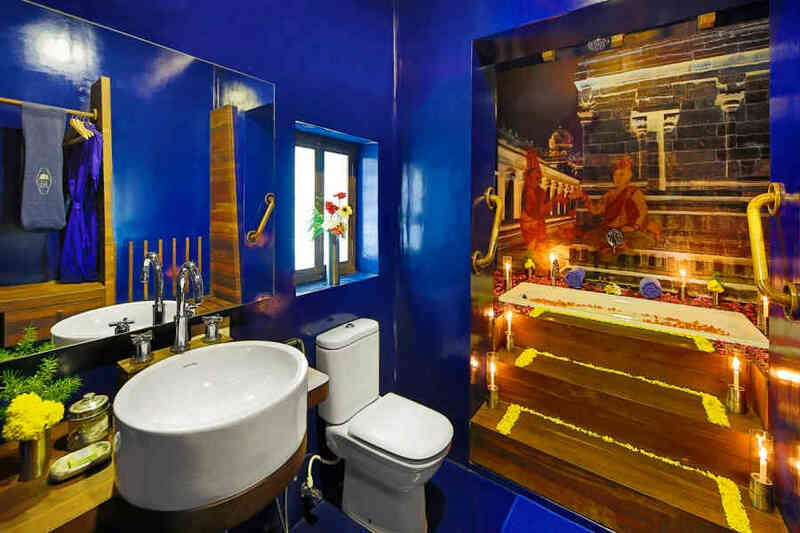 Restored with great love and care, this mansion features stunning artwork all through the interiors. 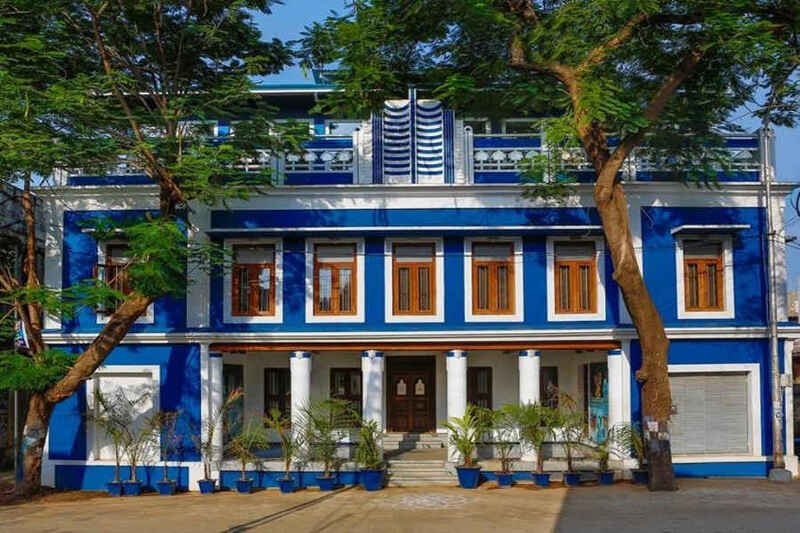 The colors blue and white feature prominently across the exterior and interiors of this heritage structure. The clean lines of the mansion are highlighted by the wood doors and many windows that dot the façade. 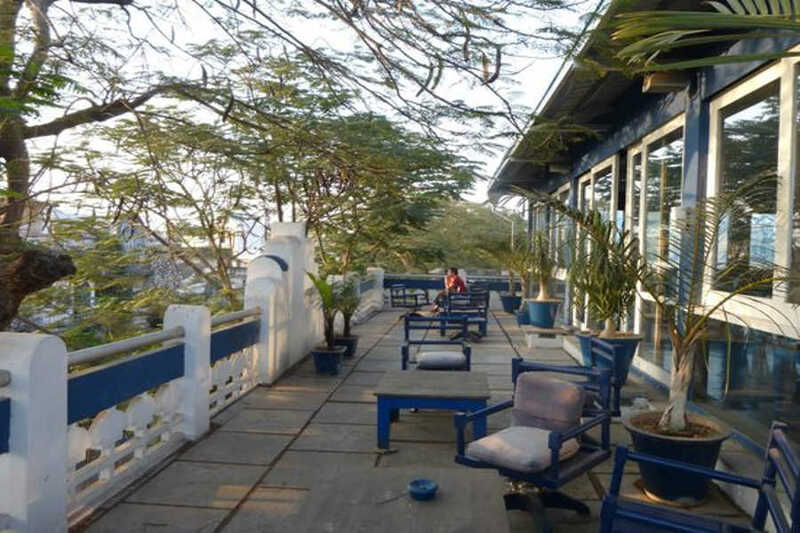 The rooftop restaurant at this Heritage Boutique Stay in Thanjavur offers a wide range of Indian and Continental dishes to tantalize your taste buds. 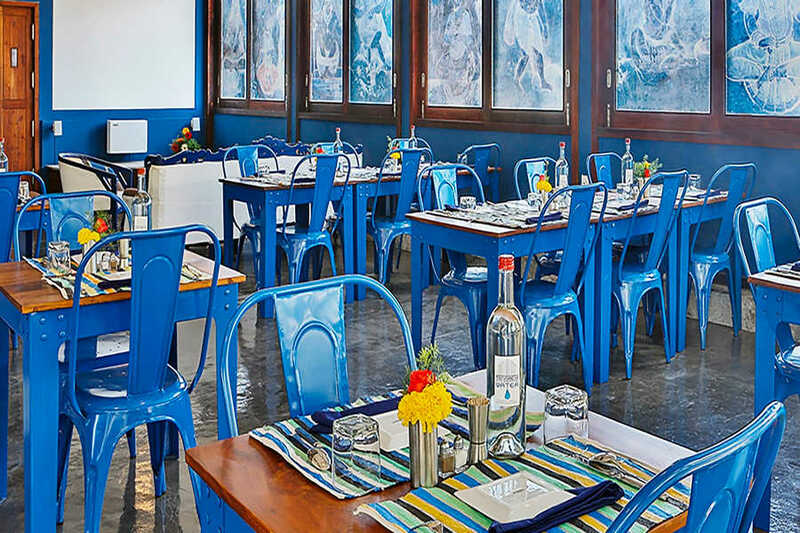 Ayurvedic, healthy, low carb, vegan, and gluten food options are also available at this restaurant. Organic fruits and vegetables sourced from the hotel’s farms elsewhere are used to prepare the made-to-order food here. Guided tours of the major attractions are arranged on request as well as day trips to other nearby towns of historical significance, or you can choose to explore the city on your own. 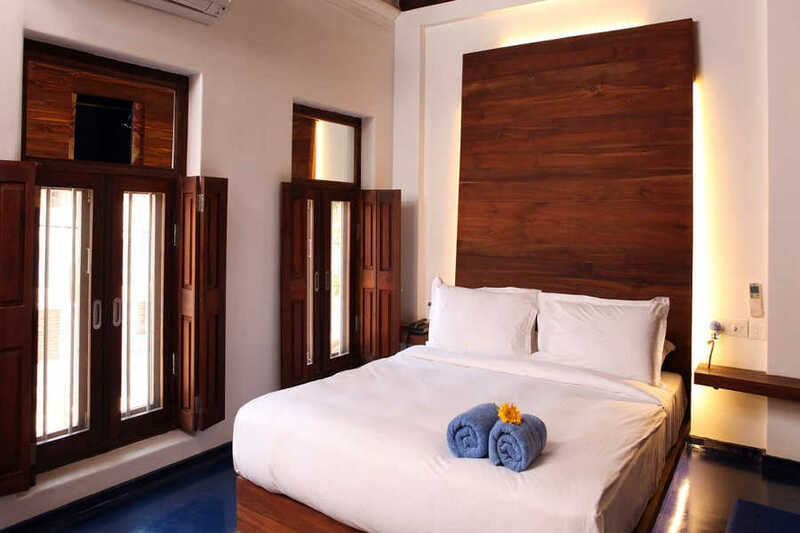 There are 14 spacious rooms at this Heritage Boutique Stay in Thanjavur. 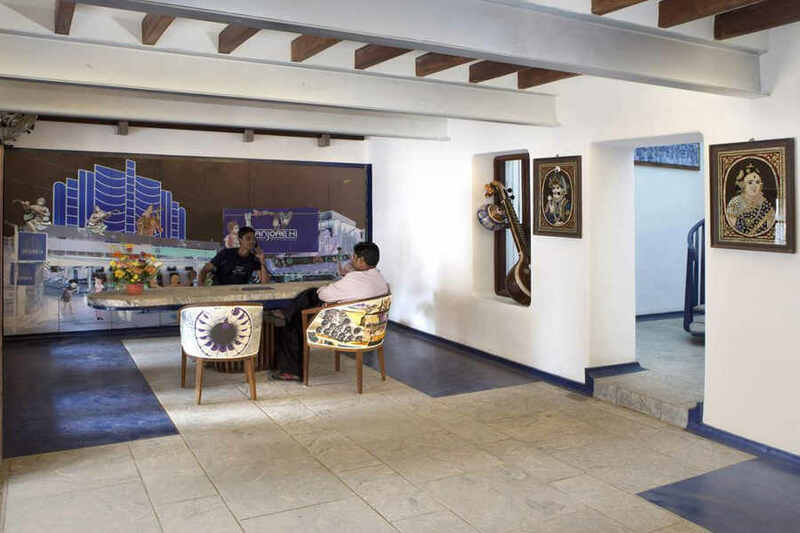 Each of the rooms features elegant wood furniture stunning photographs and artwork. Air conditioning is available in all the rooms which also have organic linen in keeping with the eco-conscious theme. LED lighting, solar water heating, organic toiletries, and CFC-free mini-bars have been put in. Plastic use is minimal and glass bottles with water are available in the rooms. Some rooms come with a bathtub. This is the perfect spot to unwind after a day of hectic exploration and cultural experiences. Peak season supplement applicable from 16th Dec’ 18 to 02nd Jan’ 19. Cancellation of a reservation between 30 days to 15 days of the arrival date will incur a cancellation charge equivalent to one night’s accommodation by the hotel. In case of no-show or cancellation within 14 days of arrival, will incur a cancellation charge for the entire length of stay. Besides relaxing in the comfort of your room at this heritage mansion or enjoying meals at the rooftop restaurant as you socialize, there is plenty you can do. Most of the major attractions in Thanjavur are within easy reach of the property and you can request for guided sightseeing arrangements to be made or simply explore each attraction at your own pace. The Thanjavur Palace and Museum are just a short walk from the mansion while the Brahadishwara Temple is 4 km away. Also known as the Big Temple, this is a UNESCO World Heritage Site dating back to the 11th century. The Sivaganga Park adjoins this temple and has a water body with boating as well as a toy train and mini zoological enclosure within. The Saraswati Mahal Library which houses more than 30,000 European and Indian manuscripts written on palm leaf and paper is also near the property as is the Maratha Palace which dates to the 16th century. Trichy International Airport is the nearest at 62 km while Coimbatore International Airport is at a distance of 267 km. Chennai International Airport is 324 km away and Kempegowda International Airport, Bangalore, is at 430 km. Thanjavur railway station is within 3 km from the property while Trichy Junction is 62 km away. Salem railway station is at 200 km while Bangalore railways station is 403 km away. Trichy is 58 km away while Dindigul is 155 km via Trichy-Dindigul Road and NH83. Puducherry is 164 km via NH36 while Madurai is 190 km via NH38. Bangalore is 398 km via NH44.